Many customers give toys to charitable groups. They have asked for plans that are cute, but not too time consuming to build. They must be durable, yet inexpensive. These toys are designed so that all pieces can be cut on your table saw. Make from 3/4" stock. 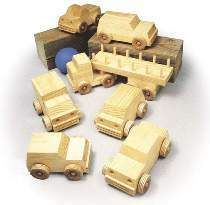 FULL SIZE patterns for six small trucks and two versions of a semi. Order 1005 Wheel and Axle Kit which includes #W1997 Plan, 40 axle pegs and 40 grooved wheels to make one of each vehicle pictured, or the 1004 Combo which includes #W1997 Plan, 400 axle pegs and 400 grooved wheels to make up to 100 cars.